I've been knitting since I was a child, first taught by my Norwegian grandmother, then I had more formal instruction in grade school Home Ec class. Since then I've learned many techniques from books, formal classes at Stitches, TKGA, Midwest Masters, and many other conventions and seminars. I've never been a knitter who wanted to follow written patterns, preferring to do what was in my head. When other knitters see something I've designed and knit, they usually ask "Can you write that down for me?". So now I am doing just that. 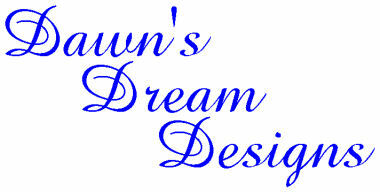 I launched my professional design business, Dawn's Dream Designs, in 2002. Two of my Nightie designs are now available in a nationally published hardcover book by Sterling Publishers and Rita Weiss/Creative Partners called New Ideas for Today's Knitting. Frills on the Side Scarf pattern published in the 2008 Knitting Pattern a Day Calendar, by Accord Publishing. Kate's Cape pattern published in the 2007 Knitting Pattern a Day Calendar, by Accord Publishing. Julia's Hat, published in the 2006 Knitting-Pattern-A-Day Calendar, by Accord Publishing. Sweet and Simple Swaddling Blanket, my specialty baby bunting blanket pattern, published in the Winter 2003 issue of INKnitters Magazine (Issue #11). Stitch Pattern Play Primer, my article about adapting stitch patterns for more options, also featured in the Winter 2003 issue of INKnitters Magazine, along with my bunting blanket, above, and slippers, below. Shapely Secrets Socks, my design published in the Fall 2003 issue of Dawn Brocco's Heels and Toes Gazette, showing my little tricks of shaping stockinette stitch socks for a better, snugger fit to hug your legs and your ankles, but without interrupting the stitch pattern of the self-patterning sock yarns. Popcorn Lace Rib socks, my design published in the national knitting magazine Cast On, published by The Knitting Guild of America, Fall Accessories Issue, 2002. I have shared some of my small project patterns online, as my way of giving back to the wonderful online knitting community. Please browse through them: Free Patterns Page . I am also a professional knitting instructor. I teach both beginner and more advanced knitting classes in the northwest suburban Chicagoland area, as well as giving lessons as requested for my guild (see below for guild info). For Information on my classes offered at Hobby Lobby, Click Here. Feel free to contact me for information on classes, or if your knitting group in the Chicagoland area is looking for an instructor for various topics. I'd be happy to travel to other guilds or shops in the area to conduct workshops. My knitting awards include 2 Wisconsin State Fair first place Blue ribbons, plus a Blue Best of Show, for my original sock designs (2001 and 2002); plus a second place Red ribbon for my original design Knotted and Baby Cabled mohair blend pullover (2002). I stopped entering fairs after this, to concentrate more on my designing and teaching business. I started my local knitting guild in the fall of 1999 in Northern Illinois, since I didn't know any other knitters locally, but hoped they were out there somewhere. Indeed, they were! We've been together and growing rapidly ever since. I maintain our guild website with info here: Cultured Purls of McHenry County. I also became a spinner in 2001, and I'm enjoying learning this fibercraft and making handspun yarn on any of my four spinning wheels from natural fibers for my knitting use. Pictures of my wheels and some of my skeins are on my Spinning page, with updates as I have time to spin more skeins. I began my online knitting life as a member of the KnitList, Socknitters, Ample Knitters, Knit Design, and the SpinList email lists (among many others), that helped me expand my knitting knowledge, and make many new knitting friends! 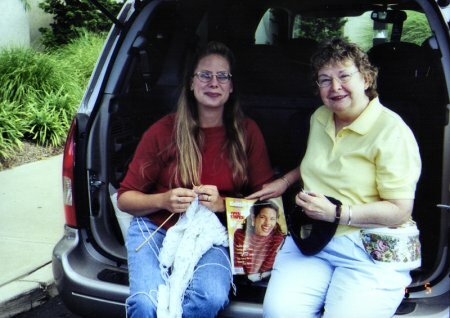 I met my best Knit Buddy, Barbara (on right, below), from the KnitList in 1998. I finally got to meet her in person on a joint family trip in 2002, (plus we've enjoyed other fun trips together after). Here we are in the back of her van, knitting in hand, of course. I also have a separate personal knitting website, Dawn's Knitting Notebook. Please visit to see what I've been working on, plus many designs from the past that could show up here in the future! Please let me know if you see a past design that you are interested in!